I really never want to document (a word used by many photographers which I do not like) garbage or the ugly. When I scan the plants of my garden particularly my roses I want to do it when they are at their most beautiful prime. I purchased Hosta ‘Neptune’ last year at Thomas Hobbs’s Southlands Nursery. I was attracted to its narrow and very blue leaves. In our newish Kitsilano garden there is little room so I placed it in an area that got very little light and it was hidden from view by a large hosta. By the time I remembered the plant did not look too good and it had been eaten up by aggressive slugs that were not put off by the thicker substance leaves of this plant. The hosta is now in a pot getting more light and it looks a mess. 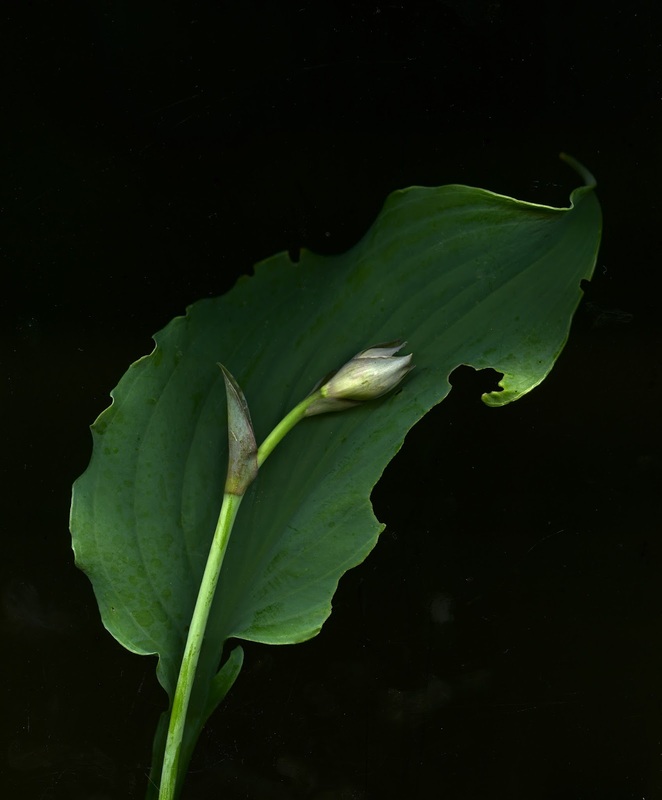 The flower (not yet open) is most elegant at the end of the scape (hosta nomenclature for stem). It also shows characteristics (elegant they are) of the Tardiana group of hostas of which one, ‘Halcyon’ is a parent of ‘Neptune’. So I have decided to scan the flower and the best of the leaves. Next year I will see what the opened flower might look like.